09 Mar What do the Numbers Mean? Posted at 11:25h in Cycle Class Tips by Justin G.
One of the most common questions we get is how to interpret the numbers you get in the stats email after every class. 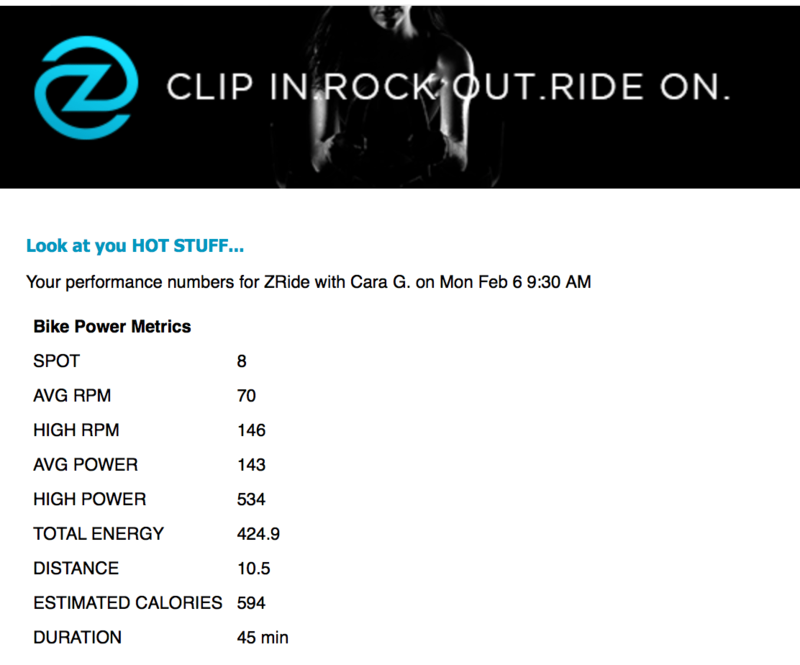 Turn on your bike console to get an email like this after every class! First let’s address some of the why behind the what. Our entire experience — from the heart-pumping music, to low lighting and inspirational, athletically-driven coaching is designed to help you find and become the best version of yourself … and critically to continue to improve. It’s impossible to plateau in indoor cycling because you can ALWAYS add more resistance. So the numbers and stats help keep you accountable and provide a way to measure progress. We have many riders that were burning 300-400 calories per class when they started riding and only a few months later regularly burn 700-800 calories in a 45 minute class. That feeling of growth is incredibly empowering and pushes you to strive for continual improvement and success. Average RPM: This is the average speed of your pedals/feet in Revolutions Per Minute. There’s no “good” or “bad” number here — it will often depend a good bit on the class profile and how many fast vs slow songs. High RPM: This is the highest speed (again measured in RPM) that you hit at any instantaneous point in class. While again there’s no right or wrong number here, if you’re hitting 140-150+ RPM, you probably need to add resistance to your bike during those max effort sprints as that’s likely to fall outside your peak efficiency zone. Average Power: This is the average power output (measured in watts) over the course of the ride. One cool metric you can track is whether or not you can maintain the same average power in a 60 minute class as you can in a 45 minute class. High Power: This is the maximum instantaneous power number all class. Because cycling is a slow twitch activity (and thus can’t bulk up your legs — see blog post on this topic), if you want to substantially increase your max power, you’ll need to do fast twitch weight training, though obviously modest gains are possible with an improvement in both technique and overall fitness level. Distance: This is an estimated distance you would have traveled if riding outdoors. This can be a helpful metric if you’re training for a triathlon or similar. Estimated Calories: We know that for many, this will be the most important number. You’ll need to enter your weight to your Zoom profile to get estimated calories. The calorie number you get in the email is the most accurate calorie estimate you can get — more accurate than a smart watch because it’s measuring not heart rate (which can be deceptively forgiving to poor cycle science) but power output — there’s no way to fool how much “work” was actually done. Secondly, it will be more accurate than the bike console because it has key data about you (namely weight and gender) that the bike console doesn’t “know.” Obviously more specific info like body fat %, percentage of muscle mass in legs vs. upper body, etc. could make the estimate even more accurate, but as far as a quick and dirty estimate, this is by far the best judge. If you ever have any questions about metrics, proper form or anything else, please feel free to ask one of our certified cycling instructors.